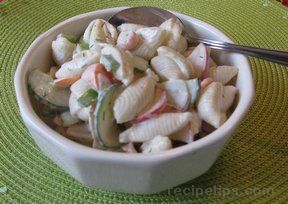 This tasty salad recipe is perfect for a light lunch or a dinnertime side dish. 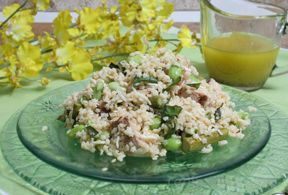 Dressed with a simple lemon vinaigrette, this satisfying salad is loaded with asparagus, edamame, pasta, and even bite-size pieces of pork. Cook pasta according to package directions, drain and allow to cool. 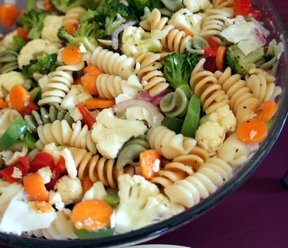 Place the pasta and edamame in a large bowl. Toss to combine. Add the basil, parsley and lemon zest. Toss to combine. Heat the grill to medium. Lay the aspargus out on a baking sheet and spinkle with olive oil. Toss to coat all of the spears. Place the spears and pork chop that is seasoned with salt and pepper on the grill. Grill the apsaragus until crisp tender and then remove from the heat. Cook the chop until browned on both sides and most of the pink is gone from the center, approximately 5 minutes on each side. Dice the pork chop and cut the aspargus into bite sized pieces. Add this to the pasta mixture. In a small bowl, whisk together the lemon juice, vinegar, salt, pepper and olive oil. Pour over the salad just before serving. Add Romano cheese, toss to coat and serve.